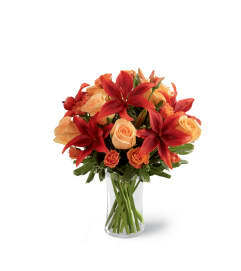 This autumn bouquet that gleams with warmth and sophistication. 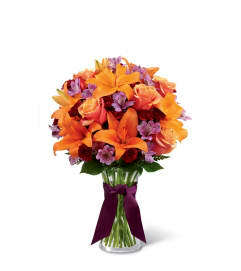 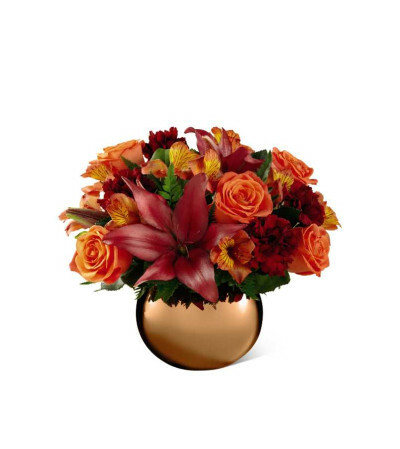 This exclusive arrangement showcases orange roses (in Deluxe, Premium and Exquisite versions only) and Peruvian lilies, dramatic red Asiatic lilies, and deep, rich burgundy carnations hand-arranged in a metallic glass sphere that glimmers with a warm, reflective coppery finish - an FTD exclusive. It makes a stunning way to celebrate all that's special about fall.